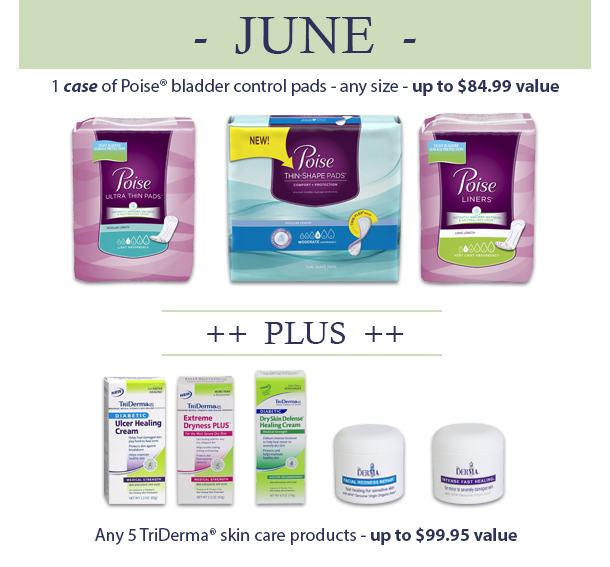 The CareGiver Partnership: Enter to Win FREE Poise and TriDerma Products- No Purchase Necessary! Enter to Win FREE Poise and TriDerma Products- No Purchase Necessary! The CareGiver Partnership is giving away five skin care products and a case of bladder control pads. Enter for a chance to win! Each month, we highlight a family caregiver solution chosen to help seniors live more independently and gracefully in their homes. This month’s prizes were chosen to help women who need extra help with skin care or bladder control live with normalcy and dignity. And entering is fast and easy — all participants have to do is e-mail or mail us — no purchase necessary and no strings attached. One case of Poise® bladder control pads: Poise offers a complete range of pads for little dribbles to sudden wetness, and just one Poise pad is as absorbent as three period pads when it comes to urinary incontinence. The winner chooses from several styles in any size. This prize is valued at up to $84.99. Any five TriDerma® skin care products: TriDerma medical-grade products are formulated for specific skin conditions, with more than 200 biologically active healing properties, including natural anti-inflammatories, antiseptics and analgesics. TriDerma is formulated for fast relief and healing without a prescription or associated side effects. The winner chooses any five products. This prize is valued at up to $99.95. For a chance to win, participants need only e-mail info@caregiverpartnership.com or mail a short statement explaining these products would be useful to him or her or a loved one. We will accept entries for this prize through June 30, 2015, and will notify the drawing winner the first week of July. Visit the “Helping You Get On With Life” sweepstakes page for details. Or explore our site for more information on incontinence, senior health and wellness, caregiver resources, or to try samples of these or other absorbent products.